At the beginning of each year, I set my sights on a few birds that I have yet to have seen but would like to. These birds, that a birder has never seen, but finally sees, are referred to as "life birds". Once you get that "life bird" or "lifer", you add it to your "life list". 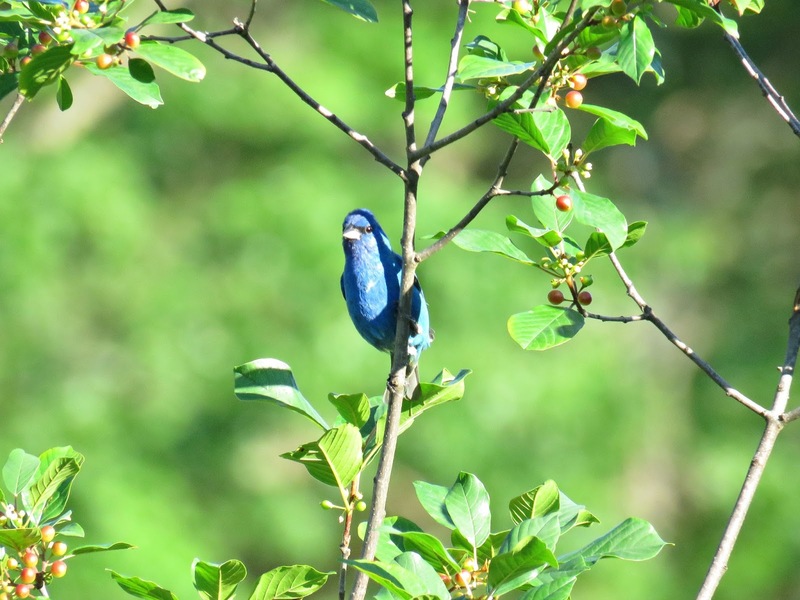 So last year, at the beginning of the year, I proclaimed that I wanted to see three birds to add to my life list: a scarlet tanager, an indigo bunting, and a bobolink. All three of those birds only summer in Massachusetts, so I knew I'd have to be vigilant during the warmer months. I first saw a bobolink in May, on the farm of one of my work properties. During the growing season, I often walk the farm to take photos of the progress of our produce which will eventually end up in ou restaurants. So I always have my camera with me. 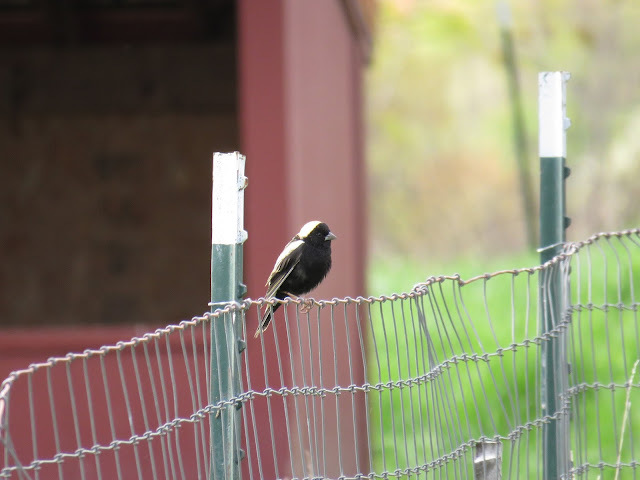 On this day at the beginning of May I was observing some savannah sparrows when this bobolink landed on the fence. Snap! First of my desired life birds for the year! I saw a bobolink twice more in 2017. 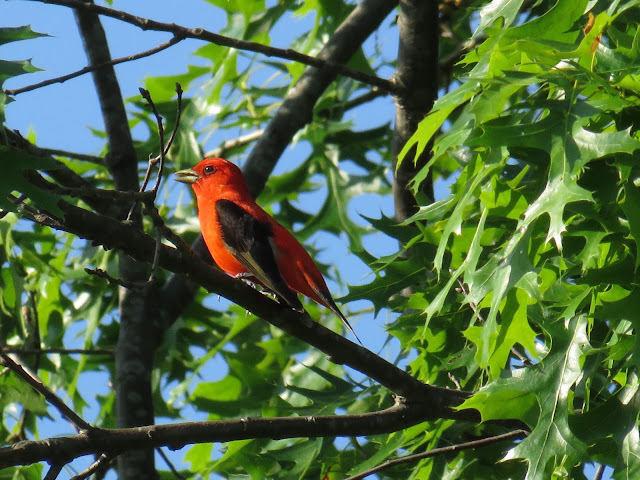 The next bird I saw was a scarlet tanager. In April of 2017 I had participated in a birding workshop with a local professional wildlife/birding photographer. and I told him about my three birds I desired to see that year. He didn't offer me any advice for the bobolink or the indigo bunting, but for the scarlet tanager, he told me, quite matter-of-factly, "just learn their call, and you'll start seeing the everywhere." I was a bit skeptical. But the first week in June I saw one flying back and forth from a bush to a tall tree. As you can see from it's spectacular color, it was pretty hard to miss, but then I heard its call. And what the pro photographer told me was true, once I heard it and knew what it was, I couldn't un-hear it! After that I saw scarlet tanagers nearly every day I hiked throughout summer. I always heard them before I saw them however. They do tend to stay on the very tips of the trees, so they are difficult to locate sometimes if you don't know where to look. But just listen and you will find them. So all that was left for 2017, was the indigo bunting. 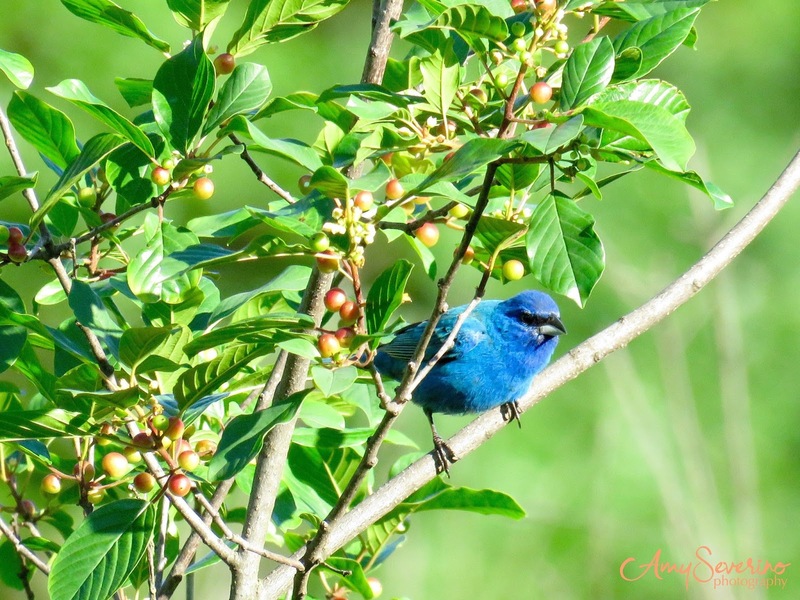 As the summer approached and began, I saw many folks on the birding forums post sightings of the indigo bunting. So I knew they were around. Then one morning, it was my son's birthday actually, I was on an early morning hike just after the sun came up. I saw something blue out of the corner of my eye. I'm a sucker for bluebirds and will always stop to enjoy them as they flutter about. So I stopped and started snapping away. This flash of blue was pretty far away. But it seemed bluer than normal. 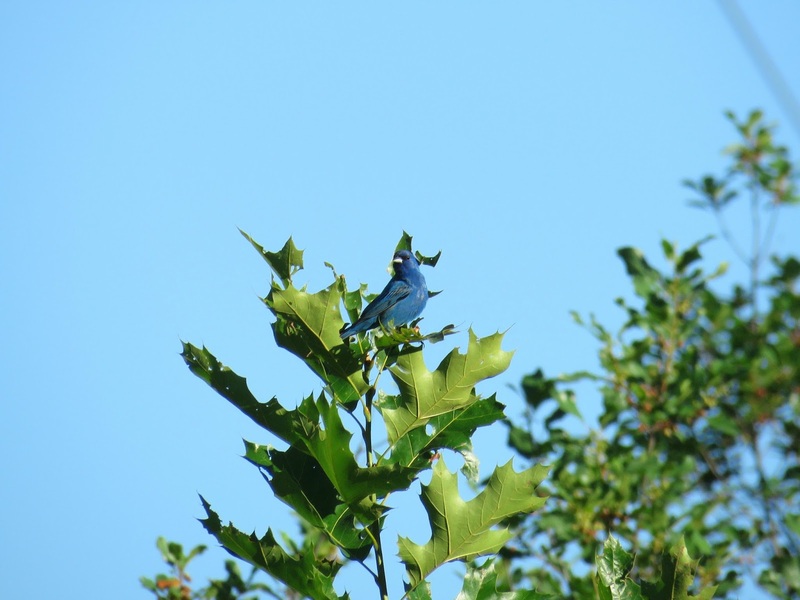 So I reviewed the photo in my camera and saw that it was not a blue bird, but in fact, an indigo bunting!!! In the remaining 30 seconds, of what was probably only a 60 second encounter, the indigo bunting flew closer and closer to me until it finally flew away. This lovely bird was kind enough to stop on this bough just a few feet in front of me, for me to obtain this pretty snap! So far that sighting was my only sighting of the indigo bunting, but I still smile so widely when I stumble upon those photos of my brief brush (ironically in the brush) with this brilliant blue bird. Please join me tomorrow for the letter "J". Meanwhile, in earring-land, I am sharing this pair of peacock feather patterned earrings. Don't forget, commenters for the A-Z blog will be entered in a drawing to win seven pairs of earrings! That sudden line dividing the black and the white on the bobolink is so darn cool! As soon as I hit send, I am going to the Merlin Bird ID app to hear the scarlet tanager to hear what is sounds like! And that last Indigo Bunting photo ~ that POP of blue with the green and faint berry background is EVERYTHING good about your bird photography! YAY YOU!!! YOU GOT THE THREE YOU WERE HOPING FOR!!!!! The peacocks with the light brown beads are awesome! OMG those peacock feather earrings are gorgeous! So are the tanager and bunting! I would love to find some of their feathers. Thank you JoJo! And yes, those feathers would be spectacular! Thanks for sharing your thoughts on consistency meaning.